"Hey you! Feeling down? Tear down the walls!" 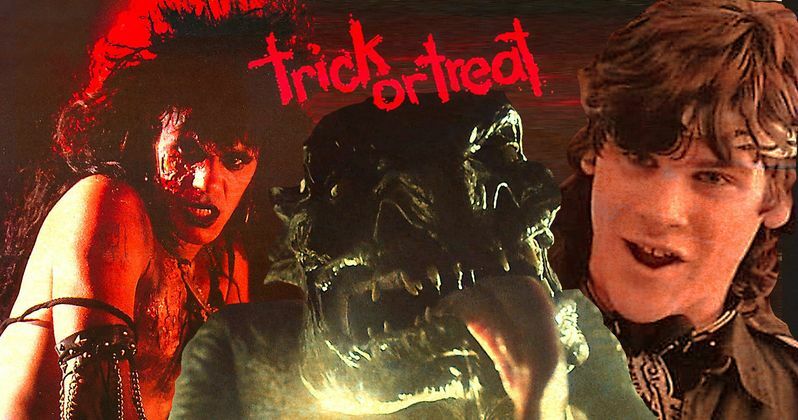 Sammi Curr is hands-down our favorite fictitious heavy metal hero, beloved by all of us fans of box-office bomb Trick Or Treat, a 1986 horror flick that's gained cult status among the metal faithful. Here we'll take a look at 10 killer facts about Trick or Treat. Touching on the supernatural, the PMRC driven fears of the '80s, and a bit of "satanic panic," Trick Or Treat tells the story of Sammi Curr, a dead rocker resurrected through "back-masking" who helps his number one fan get revenge on the high school bullies. Trick Or Treat wasn't successful enough to earn sequels but its antihero's origin is connected to the much more successful supernaturally powered resurrected slasher, Freddy Krueger. Michael S. Murphey and Joel Soisson produced the movie after making Freddy's Revenge, bringing horror F/X master Kevin Yagher with them. In a 2011 StarNews interview, Soisson likened it to "an alienated youth's version of A Nightmare on Elm Street because there was this guy that didn't come out of your dreams, he comes out of the backwards masking of a record." He added, "The way he infiltrates the real world was very similar to Freddy Krueger. Even scarring on his face probably was a little derivative in that way." Trick Or Treat was sold on a one-line pitch: "kid plays record backwards to unleash revengeful ghost rocker." This is according to Rhet Topham, who made his screenwriting debut. "Eddie is me. No doubt. My middle name is Eddie," he told the fan site SammiCurr.com in a 2006 interview. "His dress, his look, his composure, his experiences, his insight, spontaneity and chameleon-like ability to disappear in the middle of a crowd if need be; all tools of survival in high school if you're not part of the elite crowd... The way we see Eddie dressed and groomed in Trick or Treat was the exact way I showed up at Murphey and Soisson's office for that first fateful pitch." The movie's producers thought Topham's Sammi Curr concept could work as the Freddy Krueger type franchise star executive producer Dino De Larentiis wanted. In yet another connection, Topham later wrote on TV's Freddy's Nightmares. Murphey and Soisson heard actor Charles Martin Smith was looking to direct and after meeting with him, decided to let him helm Trick Or Treat, which was still in the treatment stage. Smith is most recognizable from American Graffiti and The Untouchables and makes a cameo in Trick Or Treat as the high school principal. The filmmakers initially wanted a real life rock star to play Sammi Curr, but as Smith told Fangoria in 1986, most of the guys they approached were turned off by the subject matter, given that the movie sought to poke some fun at both sides of the metal "debate." W.A.S.P. frontman Blackie Lawless was reportedly in talks. Gene Simmons of KISS was offered the part, but turned it down, opting for the smaller role of local radio DJ Norman "Nuke" Taurog. Smith ultimately elected to go with an unknown, the late Tony Fields, who'd worked as a dancer on TV's Solid Gold. Early magazine articles teased a look at a cool daydream fantasy sequence where Eddie imagines himself as a badass Conan the Conqueror type ripped straight from a heavy metal album cover. It would have been homage to the great artist Frank Frazetta and a bit of a nod to legendary producer Dino De Laurentiis, who oversaw Trick Or Treat and the Conan movies. Unfortunately, this scene didn't make the cut. Trick Or Treat is the only acting credit for Glen Morgan, who plays Eddie's put-upon best friend, Roger. Morgan, a friend of the producers, had punched up some of the dialogue. They sent him to audition for Smith to play Roger without letting on that they knew him. He's now best known for his work on The X-Files. He and James Wong were co-showrunners on Millennium and wrote Final Destination, The One, and Final Destination 3 together. He also directed Willard and Black Christmas. Ozzy Osbourne cameos as an anti-heavy metal TV evangelist. He even has a post-credits scene, which was much less common in the '80s. Simmons had already acted a few times, but Ozzy of course was a different animal. "I felt it was better not to give Ozzy scripted lines because what he came up with was much more interesting than the script," Smith revealed to Fangoria. "We probably got about 45 minutes of material out of Ozzy. No way that all that's going to get into the movie!" The Sammi Curr songs in the movie and on the accompanying soundtrack are the work of Fastway, named for its founding guitarist, the late "Fast Eddie" Clarke of Motorhead. It began as a supergroup, with Fast Eddie joined by members of UFO and The Clash. Fastway made a gold-selling major label debut and toured with the likes of Ozzy, Iron Maiden, and AC/DC. Their fourth album doubled as the Trick Or Treat soundtrack and it delivered in spades, if you'll pardon the Motorhead pun. Trick Or Treat was their last album with singer Dave King, who went on to form Flogging Molly. MTV aired the music video for "After Midnight," which featured Fast Eddie, Fields in character as Sammi, and a rhythm section cloaked in silhouette. Iron Maiden has Eddie, Megadeth has Vic Rattlehead, and Sammi Curr has Skeezix. The idea for a literal devil character evolved into a demon companion for Sammi, a monster that would have been seen on Sammi Curr album covers and merchandise. While we only see Skeezix for a brief but memorable scene, Yagher constructed the little devil with detailed finesse. When Smith saw Yagher's work, he expanded the scene just a bit, but admitted he wished we'd seen more of the little guy. "Maybe he can star in the sequel," Smith said during that Fangoria set visit.